Discover Nha Trang beach, one of the most beautiful beaches of the world. 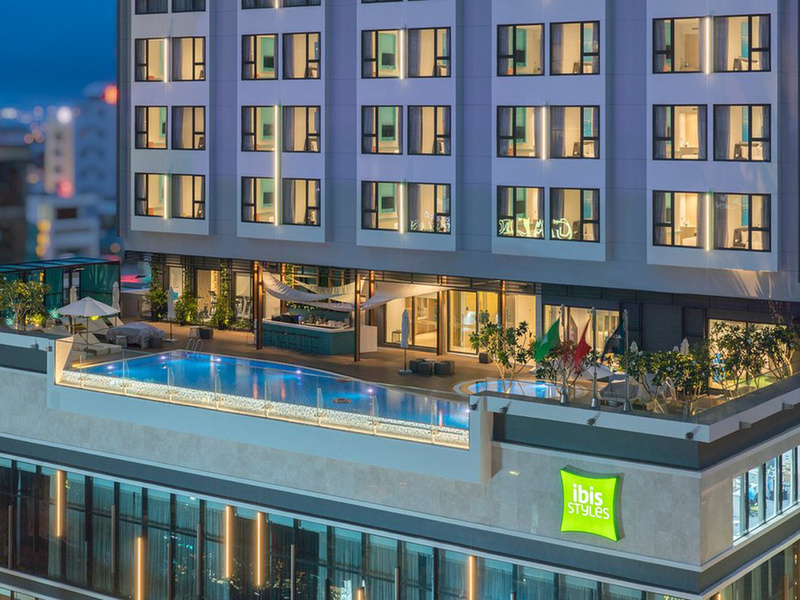 Ibis Styles Nha Trang is the first ibis Styles property in Vietnam, located in the city center, a short walking distance to the beach and famous tourist attractions. The lifestyle e conomy hotel comes with 310 unique decorated, comfortable rooms including family suites. It includes outdoor pools, fitness, kids' corner, spa, convention rooms, international restaurant and 2 bars. An ideal place for both leisure and business travelers. Kid's menu for children under 12 years old. STREATS Restaurant - all day dining restaurant featuring local and international cuisine. It serves a buffet breakfast and street food a la carte options for lunch, and dinner. STREATS Lobby Bar located on ground floor and aiming at creating a fun idyllic place for businessmen, families, tourists, and locals where they will feel comfortable and relaxed while enjoying a coffee, snacks or selected drinks. Chill out at our STREATS Pool Bar, which serves a wide variety of alcoholic and non-alcoholic drinks as well as light snacks. Located on the 3rd floor, near the iBliss Spa and fitness center. We got nice upgrade room and was offered a complimentary late check out. The room is quite small but is nice, clean and full-equiped. To sum up, we really enjoyed our stay here thanks to Mr. Tan and his excellent team. See you soon! Greeting from staff, good service, hygiene, multi breakfast buffet. Reception was friendly, room is clean and modern. Located near beach, mall and night market. Perfect stay for us. A benchmark to build good customer experience. My sincere appreciation to Ms Hieu Nguyen (Mary) = Guest Experience Manager, she did a very good job to ensure that being a Le Club member that everything is fine during my stay, this is awesome for Ibis Nha Trang. Thank you, Mary. Shower really weak, complained it before and still happens. room is big with nice view. Hotel is very well organised. Breakfast was alo very good. a lot of food choice. As an Accor gold member I got a room upgrade to Family Room. A fantastic room, with separate bed and lounge rooms and two bathrooms. The room was modern, light and had a sea view. The staff were also very friendly. Enjoyed a good breakfast buffet and one evening had the seafood buffet. The freshly cooked meats and seafood were delicious but other dishes had been prepared two or so hours before we ate and were, mostly, a little tired and unappetizing. However, the price compared to other hotels was very competitive, so you get what you pay for! Overall a fantastic stay. It was really good. I and my boyfriend booked a combo in ivivu.com and stayed at your hotel. Our room was standard but we were upgraded to superior with sea view, it made us feel so great to enjoy our holiday. Your staffs were friendly, helpful and professional. We always be welcomed. I very love your room with a beautiful blue and convenient furniture. Highly recommend! Dear Phan Dang Thuy T. , We would like to thank you for your wonderful review regarding your holiday at our hotel. We are pleased that you had a great experience with the room upgrading to Superior sea view. Once again, thank you for choosing us and we look forward to welcoming you back in the future. With best regards, Hieu Nguyen (Mary) Guest Experience Manager. As an Accor gold member I am entitled to a room upgrade, but with Ibis there is usually only on type of room. So I was surprised and delighted to be moved to a family room which had a lounge area plus bedroom and two bathrooms! The room was clean and bright. Also the staff were friendly and helpful. So this rates as one of the best stays that I have had at an Ibis hotel. I love to stay at Ibis! Modern and hi tech decorations. Great service. Pity when I used the bathtub after along day traveling, the water became abit dark. Gotta called the room service and after flush away. It was abit better. Also, compare to other Accors 5 stars hotel, the process for member is not as good, because I had to show my member card everytime I eat, drink in the hotel, so waste of time. Normally I just have to represent the card only at checking in and the card will be photo and noted. Above all, still lovely stay.